The Report: it might be difficult to remember after two years of the circus clown in office now, but a couple of decades ago, we were also in terrible shape in the White House: the Bush/Cheney regime (though actually that should read CHENEY/bush) had gotten us into a pointless war we didn’t need and had the country enter into the “dark side” in order to try to prevent another 9/11 from happening. Included in the litany of horrible, immoral items was the laughably euphemistic “Enhanced Interrogation Technique” deployment, an illegal and utterly reprehensible use of torture on political prisoners. Under Obama, the program, admitted by the CIA to be worthless as an intel-gathering system, was quickly dispatched, but the lingering taint of possible war crimes had lead to a supposedly thorough investigation by the senate. Lead by a young intelligence agent named Dan Jones (played here by Adam Driver), the titular report refers to the final conclusions drawn by the senate sub-committee, but not before the notoriously prickly CIA had done everything they could to suppress it. Scott Z. Burn’s film follows closely the drafting of the report and the many obstacles standing in the way of getting it out to the public, even in heavily redacted form. Burns isn’t going for artistic style points, here, it is straightforward and voluminous in detail in trying to tell an extremely complicated story in a couple of scant hours. In place of visual flair, there is the compelling theatrics of Driver, whose singular delivery, where every word takes on heightened emphasis, helps make dry material a good deal more persuasive. Unlike Spotlight, an equally procedural type of drama, it doesn’t offer the emotional payoff of knowing a thing has been exposed that will change a great many lives. While a version of the report was finally released in the waning years of Obama’s term in office, to date, none of the perpetrators have ever been charged with a crime or received a demotion as a result. The Farewell: An early buzz-maker at the festival, Lulu Wang‘s autobiographical story, about a Chinese family’s decision to not tell the matriarch of the clan about her terminal cancer condition and instead fake a wedding as a means of getting the whole family back together in China one last time without her knowing, rides an emotionally tricky ride. Our protagonist is Billi (Awkwafina), a twentysomething writer in New York, still very much making her way. She is very close to Nai Nai (Shuzhen Zhou), and devastated to have to withhold the prognosis from her lively, opinionated grandmother. As the family all congregate together, including the hapless cousin forced to have the fake wedding with his Japanese girlfriend, the irony becomes more and more palpable. The conceit is like a French farce – one lie that spins into more and more complexity – but with much higher emotional stakes. The film plays a lot like a comedy, but with such a backdrop powering it, it treads a remarkably difficult line between the two poles. In the Hollywood remake, Billi would have been given a love interest in China (and there is a moment with a handsome young doctor where you can see precisely where that would begin) to give the film more cushioning, and at the end Nai Nai would have confessed to Billi that she knew “the whole time” but was simply humoring her family, which also would have spared the audience. Notably, Wang does neither of those things, so the emotional crescendo near the ending hits you with full force (although the coda right at the end throws a good deal more confusion into the mix). The Last Black Man in San Francisco: It works in ways that are difficult to describe. Through pace, tone, and image, Joe Talbot has created something that feels utterly organic and unique. 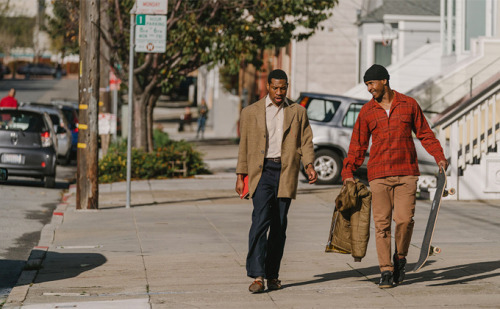 The story concerns a pair of best friends, Jimmie Fails (playing himself) and Mont (Jonathan Majors), growing up together in SF. Jimmy, who skates around the city in a knit cap, dotes daily on a beautiful house in the Golden Gate neighborhood, owned now by an older white couple but used to belong to his family, built piece by piece by his grandfather in the post-war ‘40s. Mont, for his part, is an artist and playwright, taking in the people of the city and transforming them into his own art. When the elderly couple suddenly have to move out, Jimmy and Mont quickly move in, stocking the place with the old, original furniture from storage. It is Jimmy’s fondest wish, he feels a deep kinship with the place, and is genuinely a devoted and caring neighbor. When the house is eventually put on the market, it threatens to disrupt the idyll the friends have created. Through creative use of super slo-motion, and delicate lens work, Talbot‘s film moves mysteriously, but captures the essence of both the characters and the city itself. In his hands, everything becomes a character unto itself, from the house, to a field tall with flowering weeds, to a dock that leads out to a mud flat. The sense of place, and dynamic energy infuses everything we see on screen. A scene towards the end involving one of Mont’s plays, strains credibility a bit, but even there, it’s accounted for honorablyl. It’s the best film I’ve seen so far at this festival, and will almost certainly be among the best I will see this year. Tomorrow: We start early with The Report; try like hell to jump into The Farewell; check out The Last Black Man in San Francisco; and close it out with Velvet Buzzsaw.